There’s a great farmer’s market in my neighborhood that I like to go to every Sunday. Last time there was such an abundance of beautiful, colorful produce — I simply ran wild! I ended up coming home with a tote full of fruits, vegetables, and some delicious prepared snacks (the garlic tomato hummus is my favorite). Everything looked so fresh and vibrant — I wanted to eat it all! And of course I was trying to decide what to make for lunch that would use most of my fresh ingredients. So, I decided to make my Macronutrient “Beauty Bowl” — a vitamin and mineral rich veggie and protein bowl in which every ingredient serves a purpose for healthy, beautiful skin. Macronutrient simply means nutrients that your body needs in a large amount for a healthy, balanced diet. 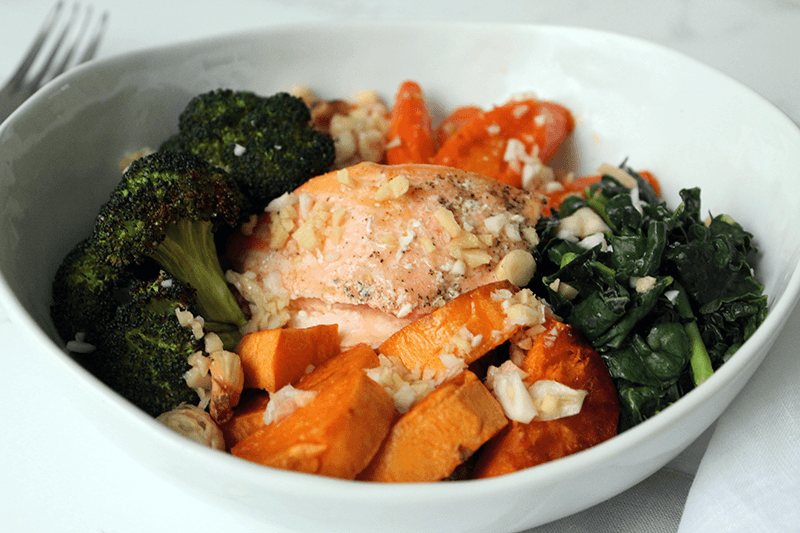 The three main “macros” are proteins, fats, and carbohydrates. So take a look at the ingredients below to find out how each of them contributes to a glowing complexion. Sweet Potato and Carrots: Rich in betacarotene, a potent antioxidant important for normal skin cell development, and glowing skin tone. Kale: Full of vitamin K, which helps reduce the appearance of dark circles. Also rich in skin-firming vitamin C and A, as well as lutein and zeaxanthin — which promote collagen production. Broccoli: Rich in vitamin C, a super antioxidant that promotes skin radiance and helps blemishes heal. 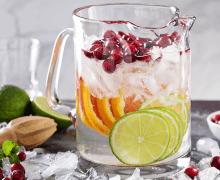 Vitamin C is key in collagen production. Brazil Nuts: A serving size of 4 Brazil nuts provides your daily dose of selenium, a powerful antioxidant that helps prevent sun damage and age spots. Chickpeas: this low-glycemic food decreases inflammation because it doesn’t cause blood sugar levels to spike (high blood sugar can cause hormonal breakouts and painful acne). Wild-Caught Salmon: Rich in omega-3s, which helps reduce inflammatory skin conditions like acne, eczema, and psoriasis. Also contains astaxanthin, shown to help reverse the damaging effects of skin-penetrating UVA rays. Quinoa: A complete protein that contains all nine essential amino acids crucial for building new cells. Additionally, it’s rich in vitamin A, which delays the aging process, and vitamin B2, for improved skin elasticity. Garlic: High in cysteine, a nutrient responsible for strong hair. Sesame Seed Oil: Rich in zinc, which reduces the appearance of age spots and maintains skin elasticity. Lime: Full of vitamin C and free-radical fighting benefits, to prevent signs of aging like wrinkles and dark spots. Ginger: Contains 40 antioxidant elements to prevent aging. Rinse and drain 1 cup quinoa. Bring to a boil with 2 cups water. After the water boils, reduce heat, and simmer covered for 15 minutes or until water is absorbed. Let stand 5 minutes and fluff with a fork when ready to serve. *Note: You can easily make this recipe nut-free or vegan. 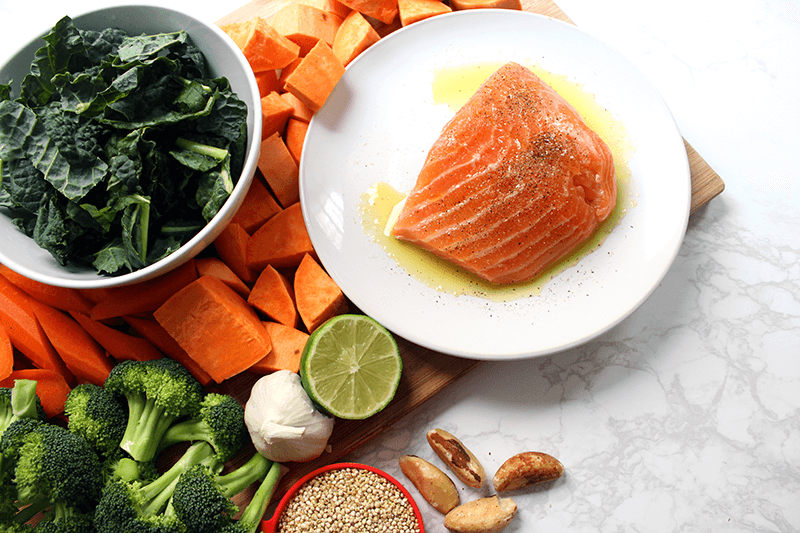 If you have a nut allergy — salmon and broccoli are good sources of selenium. Or swap the salmon for chickpeas. ½ cup of chickpeas has almost as much protein as a 3 oz serving of salmon (19 grams vs 22 grams) and is also anti-inflammatory. Preheat oven to 425℉. Peel carrot and sweet potato. Slice carrot on a diagonal and cut sweet potato into 1” wedges. Toss carrot and sweet potato with 1 tbsp olive oil. Salt to taste. Roast for 30 minutes, turning halfway through. Chop kale and sauté over medium heat with 2 tbsp water and a pinch of salt, just until slightly wilted. Set aside. Cut broccoli into florets and toss with ½ tbsp olive oil. Season with salt. Roast for 20 minutes at 425℉. Chop the brazil nuts coarsely. Set aside. 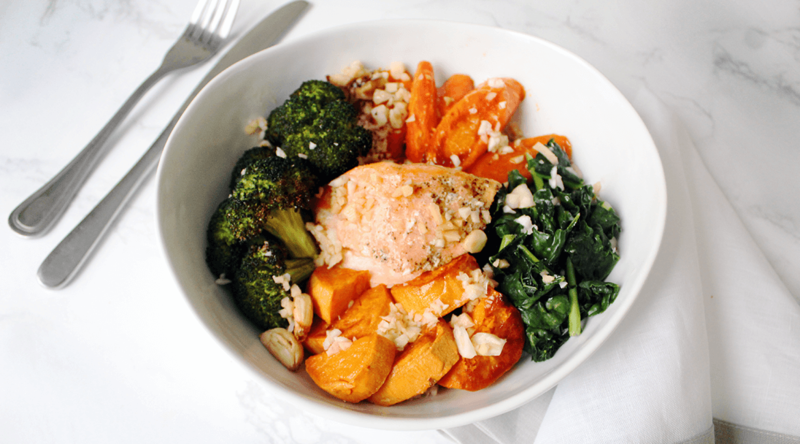 If you’re using salmon, season it with salt and pepper and roast it in the oven with the carrots and sweet potatoes for 20 minutes. (Or if you’re using chickpeas from a can, make sure to rinse and drain them first. Then pan-roast them over medium-high heat with 2 tbsp. olive oil and salt and pepper to taste, stirring frequently until golden brown). 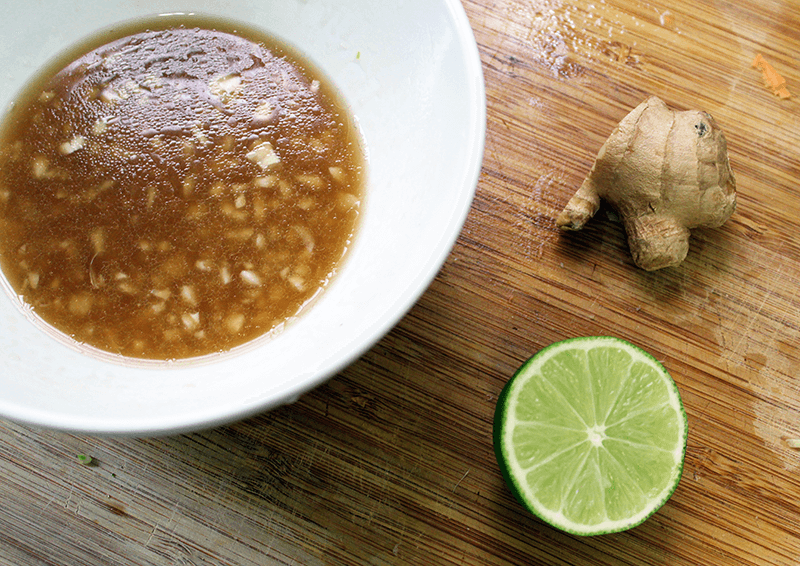 Combine the juice of 1 small lime, 2 tbsp sesame seed oil, 2 chopped garlic cloves, and 1 inch peeled grated ginger in a small bowl. Add a pinch of brown sugar to taste (if dressing is too acidic). Set aside. I like to use a shallow bowl that displays all my veggies beautifully, but you can use any large bowl. 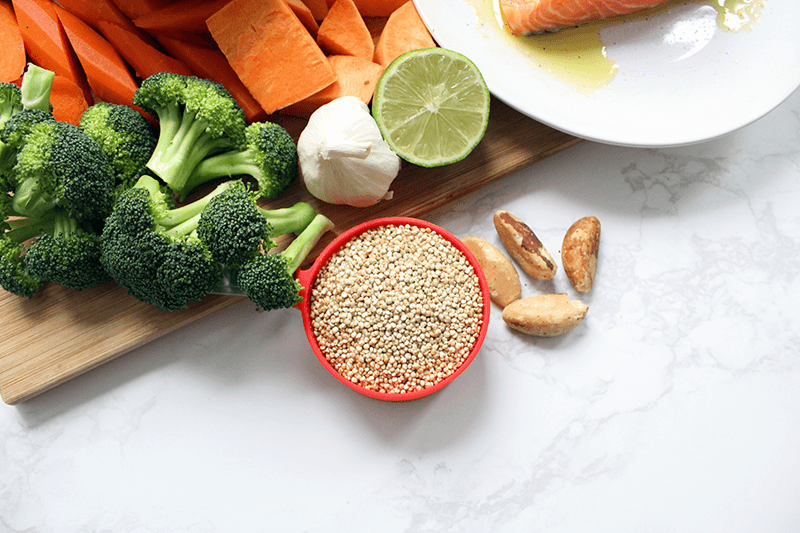 Use quinoa as a base, and arrange the veggies or fish on top. Sprinkle the Brazil nuts over the veggies. Drizzle with sesame-ginger dressing, and voila! 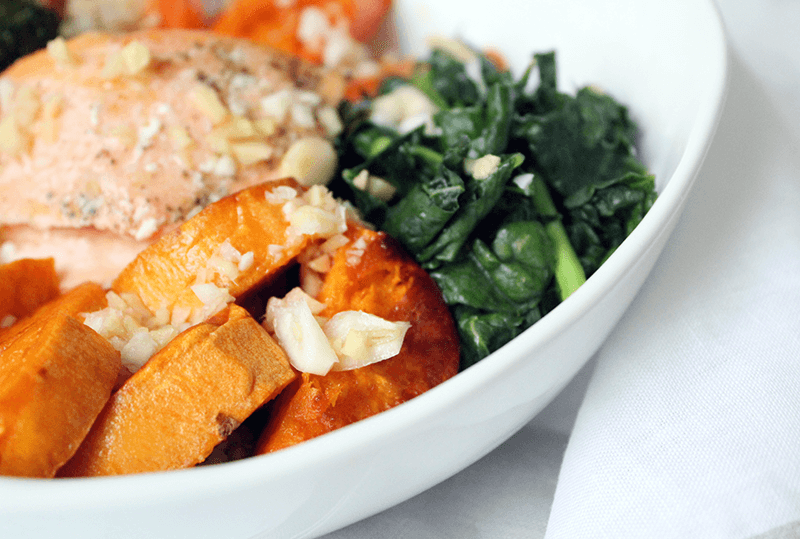 You’re ready to enjoy an antioxidant rich, beauty-boosting meal. 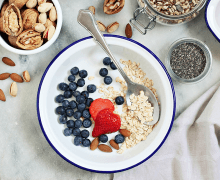 And the great thing is, this nourishing bowl not only satisfies my hunger, but is full of ingredients that work to combat signs of aging, give a healthy glow, and reduce inflammation. You can also prepare all of the ingredients in advance in larger quantities and then assemble the bowl for a quick weekday meal! By the way, are there any vegetables you simply won’t eat? Mine is celery — I just can’t stand the taste. Tell me yours in the comments below and share this recipe with a hungry friend! April 6, 2018 By Michelle R.
April 9, 2018 By Michelle R.